There once lived a king. He was walking on his battlements when he saw a shadowy figure heading towards him. The king saw it was a dragon, the King shouted “Help!” The guards rushed up to see what the matter was. The guards came up and saw the dragon and said “Oh NO!” the King said “don’t just stand there, shoot the dragon!” So, they started shooting the dragon but then BOING! The arrows bounced off the dragon. “Ha, Ha, you can’t hurt me, if you leave me food by the cave near the river every day then I won’t bother you or your kingdom.” Exclaimed the dragon. “Ok deal” bellowed the King. The princess rode on a horse to the dragon and saw his sharp teeth. At the same time she heard a voice “I am George and I am here to help.” “Be quiet, otherwise the dragon will …”, but it was too late. ROAR! 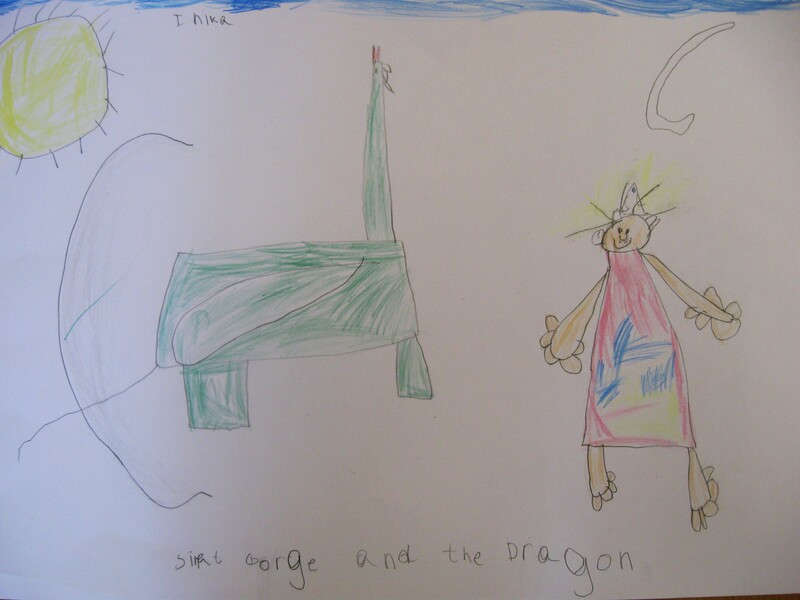 The dragon awoke, George tried to kill the dragon with his spear but it bounced off!! The princess shouted “There are no scales on his nose!” He stabbed again and this time he hurt the dragon. George said “Do you promise to never come back again.” The dragon agreed. So the King decided to give George gold, but he didn’t want it. “How about a horse?” But George just wanted another adventure! George did and he became the Saint of England and now we celebrate Saint George on 23rd April.